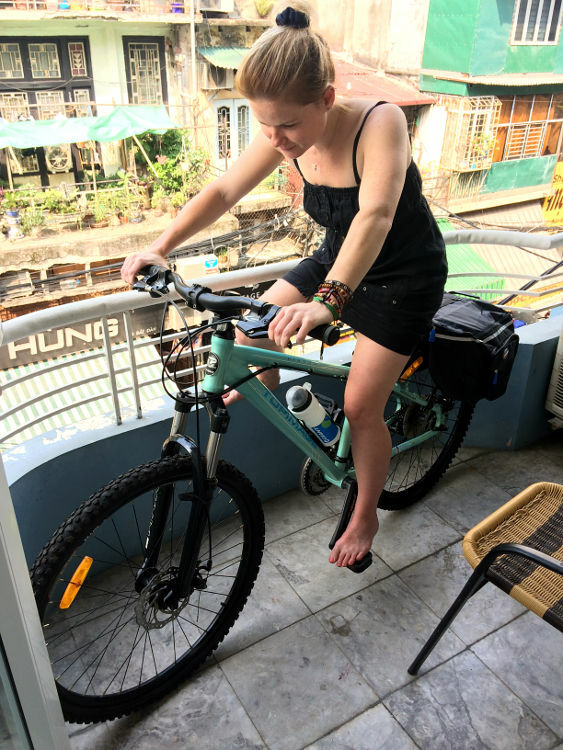 Early into our planning, Hayley and I decided we would source everything we needed for the ride from Hanoi to Ho Chi Minh, in Hanoi. Like many, we were inspired by the Top Gear Vietnam special where Jezza, Hamster and Captain Slow stumble between the cities on rusty old motorbikes they'd picked up for next to nothing. 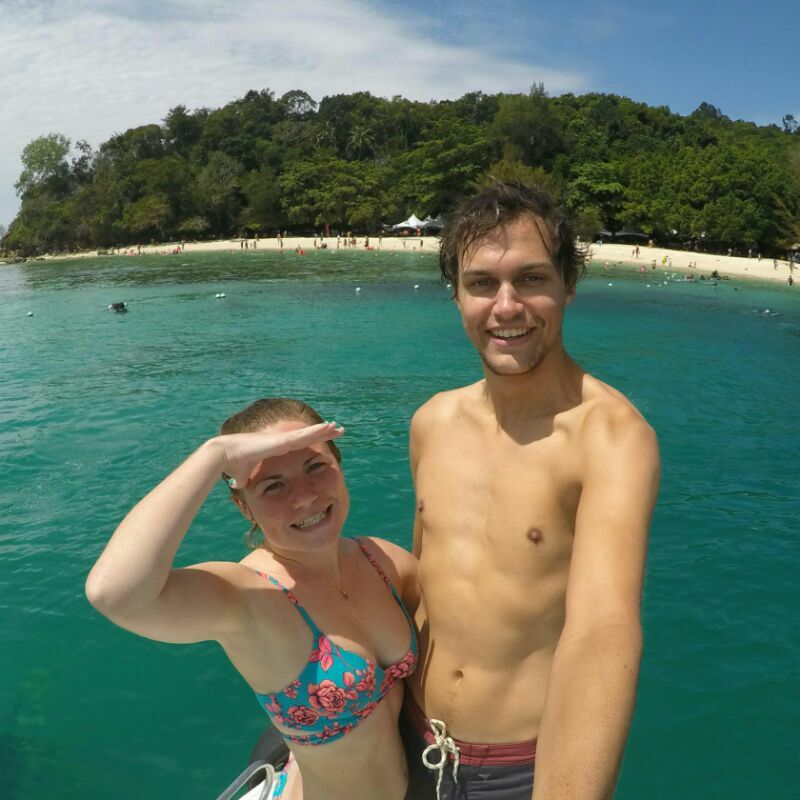 We envisaged a similar premise for our trip. 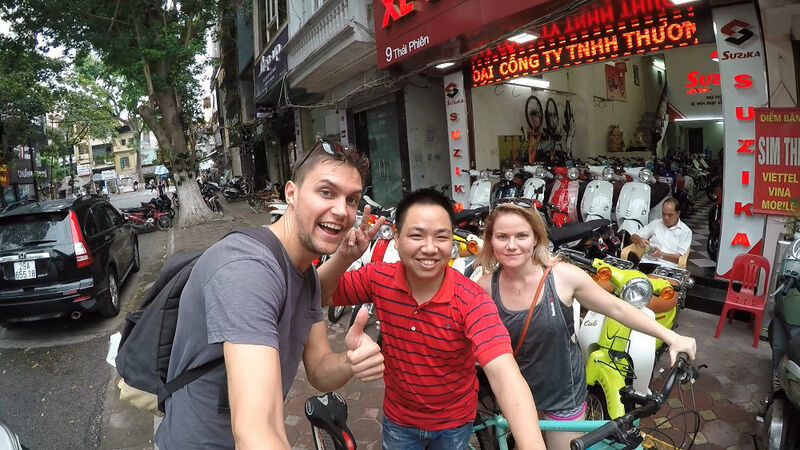 We had read about a thriving cycling culture in Vietnam and so we were confident that we too could find cheap, second-hand but faithful steeds for our journey. 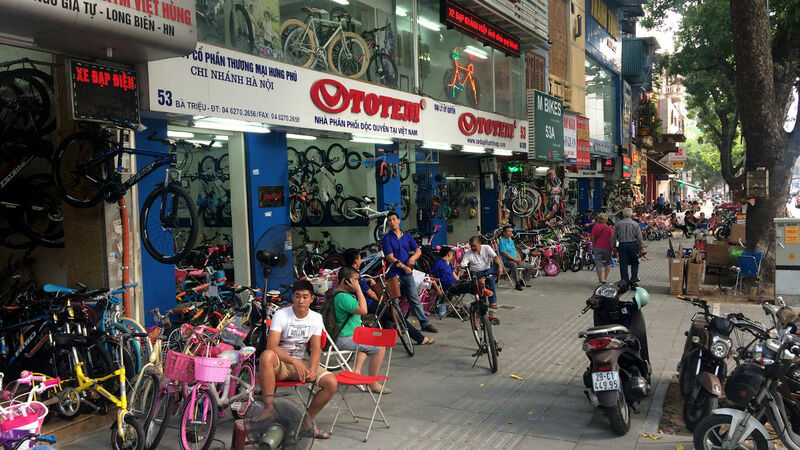 During our relatively sparse planning we had of course googled 'bicycle shops in Hanoi' and found numerous shops listed. All we had to do was head to the ones with the best reviews and we'd have our bikes, right? 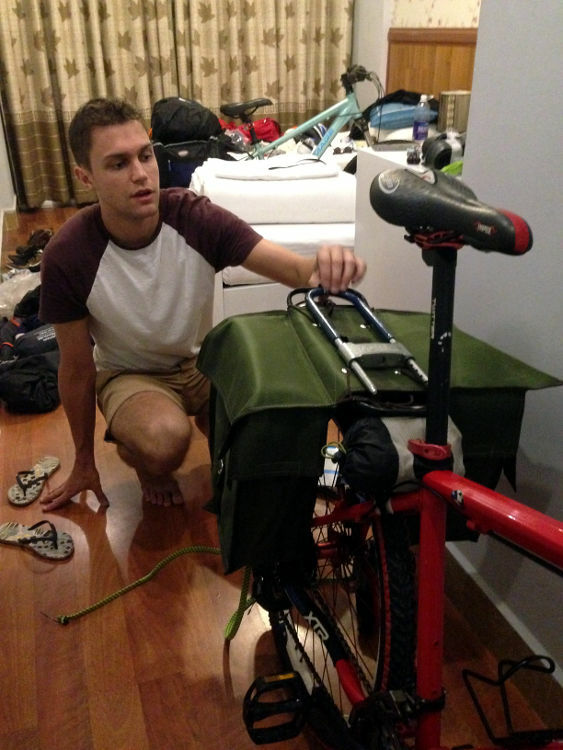 We did this on our second day in Hanoi, but all we found were expensive brand new imports. 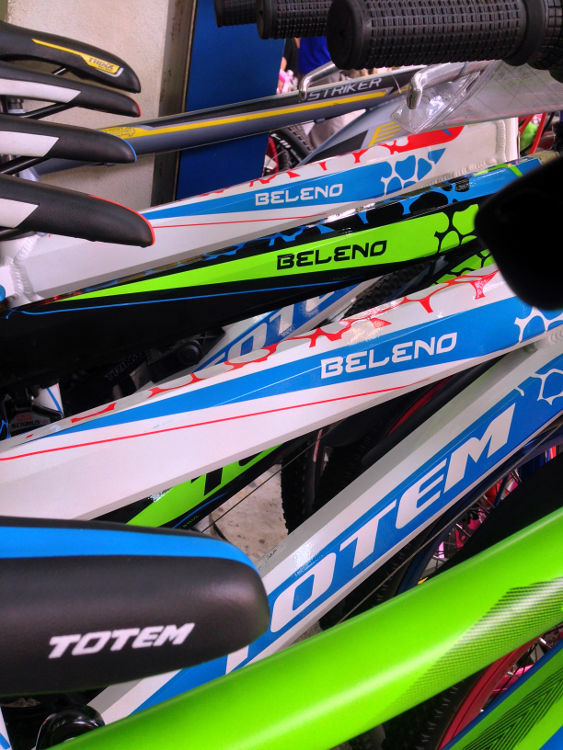 High-end brands, such as Trek, Bianchi and Cervelo; way out of our league and budget. Finding cheap, second-hand gems like the Top Gear boys was going to be a little more tricky. After exhausting cycling tour operators and hire shops, our next move came from a tip-off from acruisingcouple.com; fellow cycling enthusiasts and bloggers who we are somewhat following in the footsteps of. 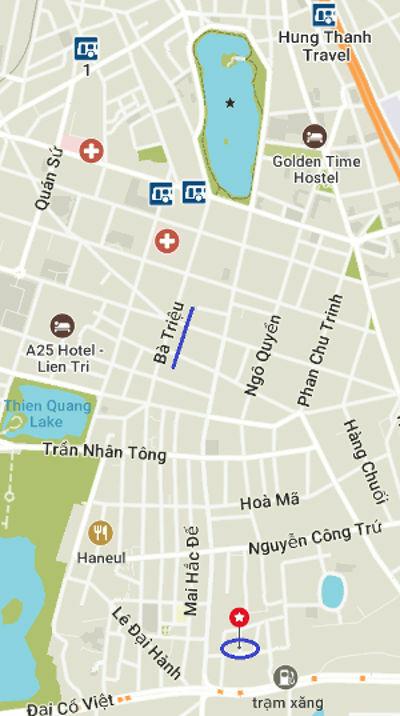 A street named Ba Trieu was where they got their bikes, "lets go there!". Ba Trieu was certainly cycling central. We walked the length of the street and counted at least 10 shops packed to the rafters with bicycles; all new mind, but much more in line with our budget. Most brands on display were new to me, some with interesting model names and lots with knock-off components; Shminig, Shimaho, Sminaho... Despite the quantity of bikes on offer, nothing quite hit the spot and our thriftiness couldn't let go of the idea of buying second-hand. We also couldn't find anything that was the right size. Hayley and I are at opposite ends of the size spectrum; our road bikes back home are 44cm and 59cm respectively. The only bikes that fitted Hayley were 24" wheel youth bikes; no good for cycling 1200+ miles. Ba Trieu - bicycles everywhere! Our last hope was a secondhand market. We'd got the address from one of the bike tour operators we'd visited previously. Unfortunately I no longer have the written address, but please see the pin in the map above for the approximate location. Here there were numerous stalls selling secondhand bikes, accessories. 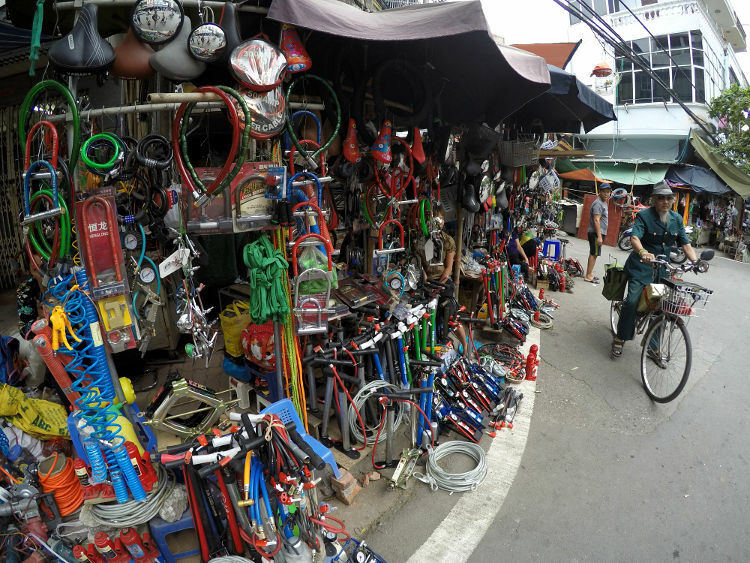 There was a lot of junk, but eventually we stumbled upon a moped shop with a few decent looking bicycles hanging up. The shopkeeper spoke absolutely no English, but with a bit of bartering using the calculators on our phones, we left with two decent, secondhand mountain bikes with aluminium frames and importantly, genuine Shimano components. We picked up the rest of our gear (panniers, racks, spare inner tubes etc...) from the surrounding stalls for next to nothing. He drove a hard bargain! Safety first. The colour has to match the bike. My bike is a German engineered BMW (yeah, i didn't know they made bikes either). It's a little on the small side, and initially I had to bodge the pannier rack on with cable ties as it doesn't have fixing points on the seat stays. This bodge lasted until day 3; when i hit a rather large pot hole. Hayley's is a Topimage (never heard of them! ), fits her perfectly, but the shifters are a little sticky and the bearings in the pedals lasted just 3 days. 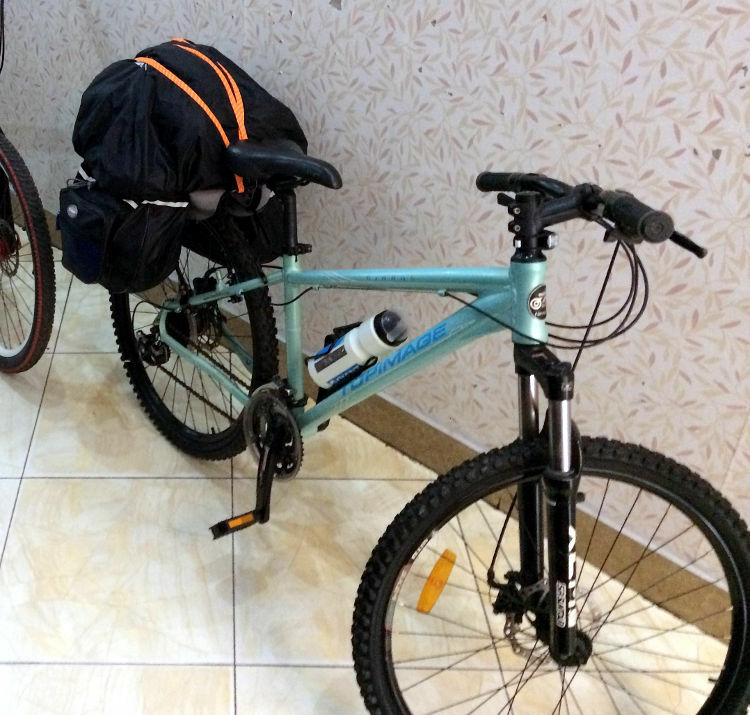 Both bikes have their little quirks, but they should make it to Ho Chi Minh (fingers crossed). 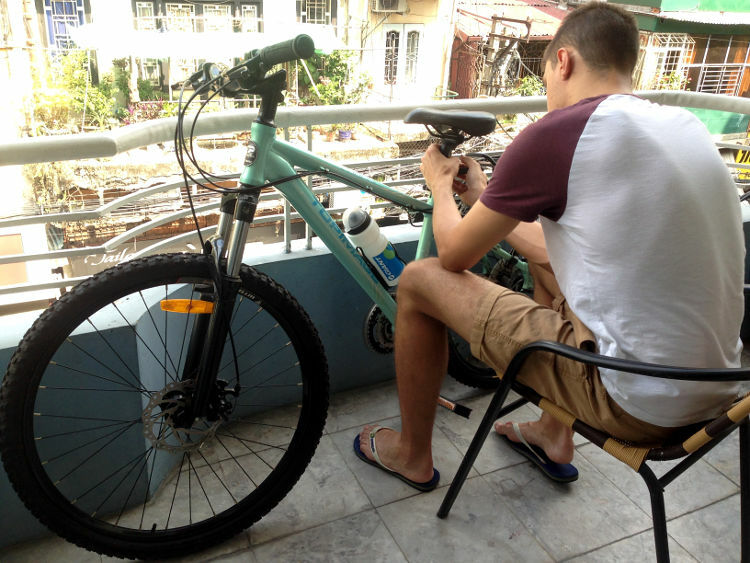 All together, the bikes and accessories cost less than £375, and we'll hopefully get some money back for the bikes in Ho Chi Minh. 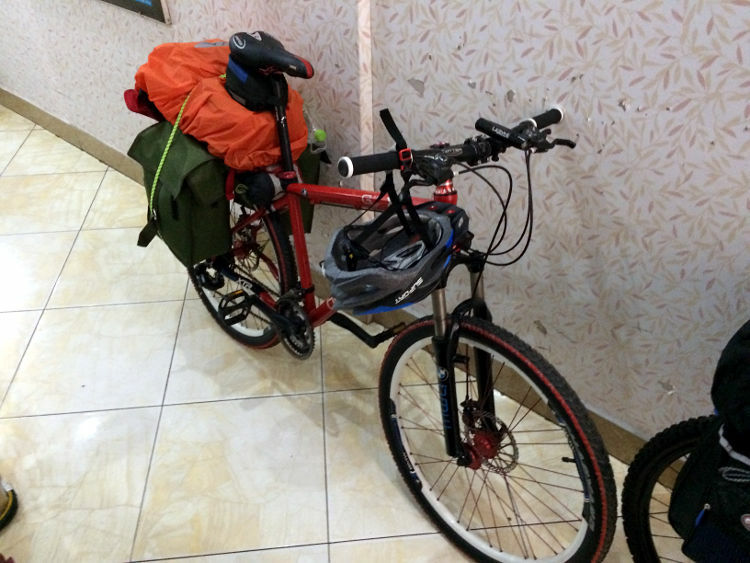 Well, to be honest, i wanted to get 700c wheel touring bikes, but we just couldn't find them in Hanoi for our budget. This has turned out to be a blessing in disguise; it would have been impossible to ride touring bikes down some of the 'roads' we have been down these first few days (bearing in mind, we have been actively avoiding the main highway). I'll refrain from providing a full list of 'what to take' just now, as we are only 5 days/250 miles into our journey and will almost certainly discover more essential items along the way. 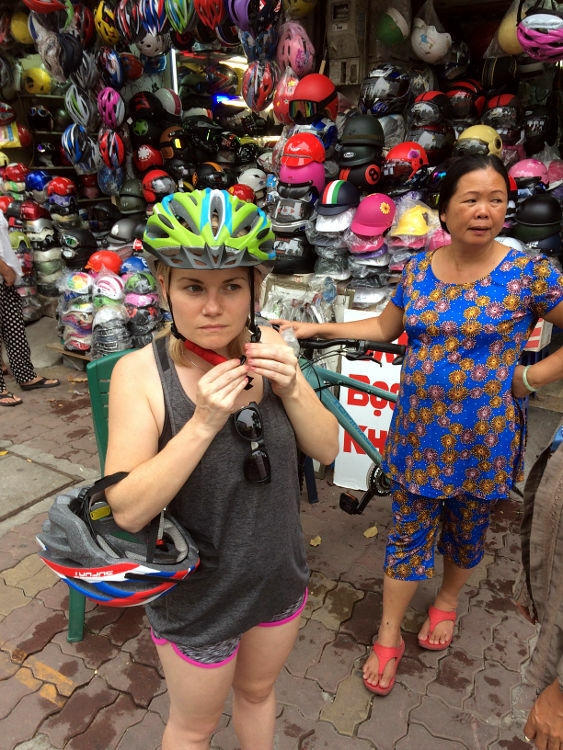 Ba Trieu Street aka Bicycle Street, Secondhand Markets and Bartering for Mountain Bikes.